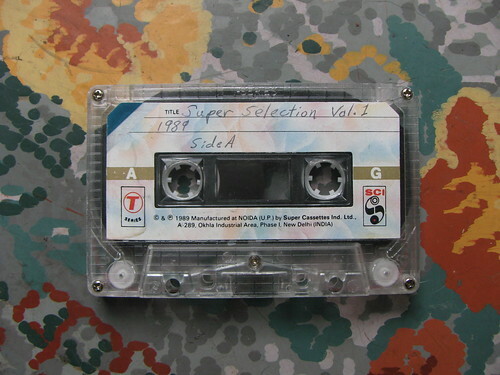 My friend Lizi asked me to digitalize a tape for her the other day, titled simply "Super Selection Vol. 1 1989." It's a mysterious collection of over-produced pop-traditional music of most likely Indian origin. I have no more information to offer. Which reminds me, Eggy tapes are now available at Container Corps a great new arts press run by my friend Gary up on N Killingsworth. They've done really beautiful work already in their rookie year, with lots more to come, no doubt. Keep em on your radar! Yep. Sounds Indian to me. Plus, the tape says that it was manufactured by Super Cassettes of India - which also released vinyl records as well. Thanks for the additional info! Also, I'm a huge fan of your site!